If you are interested in growing business or franchising, you probably are interested in reading about these topics. Here we have books written by Brian, or where he has contributed to sections of books about broader topics. We also show you some we think are the best on franchising a business. “What advice would you give to your grandchildren in order to create a better business, better life and better world?” Filled with unique perspectives and wisdom, this book promises nothing short of a life-changing experience. Brian's chapter focuses on some lessons learned through life. ‘Secrets Exposed’ is a proven series with a track record of success. In this volume, some of the top business experts in Australia talk about the things they think make business successful. 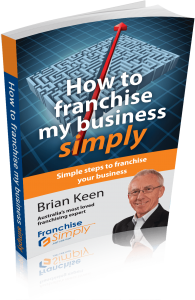 Brian's chapter focuses on using franchising to grow business. Did someone once tell you franchising is expensive and complicated and that it doesn’t really work? Are you thinking managing franchisees would be a nightmare and finding good ones is really hard? Do you want to get out of your business, but think franchising isn’t really an exit strategy?